This is the traditional Christmas fare for us. 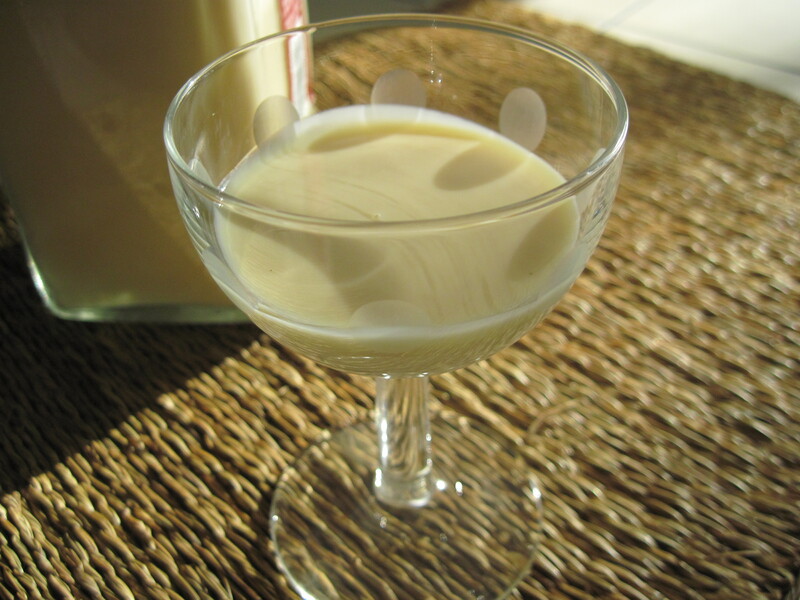 It is a relative of an eggnog, but has more character. It can be drunk, eaten with the spoon, or used as a decadent dessert sauce. Its thickness can be controlled by adding milk or using smaller eggs. Both acts should result in thinner final product. I do not recommend attempts to make it thicker – although I can imagine someone wanting to make a pudding without a sauce…In such case avoid depositing the stuff in the bottles – it will never come out. Use maybe jars instead? 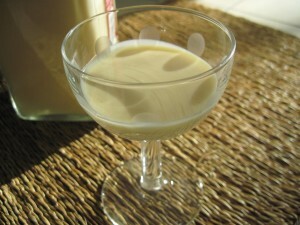 Numbers below will produce about 1 litre of thick, but still liquid, ambrosia. Excellent as gifts, when bottle decorated with a piece of a ribbon etc. 250 ml of strong alcohol – it really should be the 94% grade, but you can use whatever you have, good brandy or whisky. It will produce somewhat less satisfying yet quite tasty result. The type of alcohol you use with also determine the flavour of the final result. 94% Alcohol is also the preferred base as its original flavour is not biased. Add milk, mix carefully; i always make sure there is no residue left at the bottom of the mixing bowl.. Using some smart contraption like a funnel pour mixture into the bottles; watch for overfilling..! usually the bottles look full, but the foam subsides in time and you will be able to fill up after a few hours. Close the bottles and put away into some cool space. Fridge is ok. if you have enough room and if temperature not too low. I keep mine in the ‘cold storage room’ in the basement. For the first day i visit them every few hours, shake a bit, fill in if possible and necessary. I usually end up with one container not quite full, and this one is used to top up the others. They must sit for good few days before they are up to standard. It is ok – and beneficial – to shake them occasionally. When cool the mixture is very thick and difficult to pour out of the bottle. Room temperature for a few hours usually does the trick. Always shake before use. Leave large pieces of vanilla in the bottle. Remaining black little dots are ok, part of the exotic appeal. Final product needs no refrigeration. It benefits from the occasional shake. Served in the tiny glass as a desert drink, or as sauce, or as a component of something even more sophisticated (can you think of something?). Let me know how things develop. This entry was posted in Drinks / Napoje and tagged Boże Narodzenie, for grown-ups only. Bookmark the permalink.